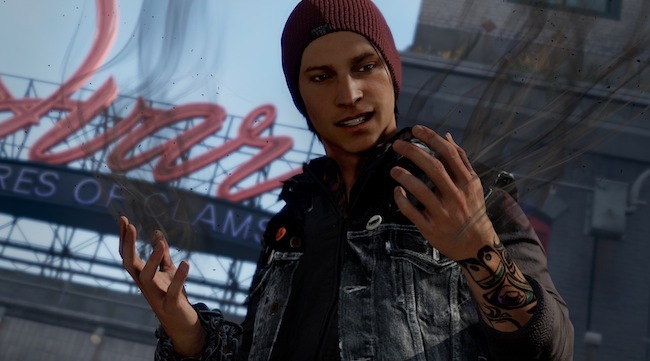 Sucker Punch’s upcoming PlayStation 4 exclusive inFamous: Second Son doesn’t hit until sometime next year, but the studio is wasting no time in hyping up the game as much as possible now. The video has a few interesting tidbits, primarily detailing just how the smoke abilities will translate into actual gameplay. By all appearances, certain areas of gameplay will remain relatively unchanged from previous protagonist Cole McGrath’s lightning-based abilities – shooting destructive projectiles, levitation, etc. – but with a smoky twist. However, the video also detailed a couple of new twists to the formula: For example, Rowe can phase his entire body into smoke for brief periods of time, allowing him to more easily dodge attacks and in some cases even phase through enemies during combat. This ability also allows players to use ventilation systems as a sort of quick-travel mechanic, and lends itself to a body-slam attack that, if the video is to be believed, looks truly devastating. inFamous: Second Son is the third game in Sucker Punch’s open-world action-adventure franchise, which began on the PlayStation 3 with 2009’s inFamous. Second Son is also the first game in the series to be set in a real-world location – previous games took place in the New York-themed Empire City and and New Marais, which had a New Orleans flavor – with the action taking place in a locked-down Seattle.